I was looking through my makeup stash recently and I noticed that I’ve accumulated quite a few Urban Decay products, and a lot of them are in my daily routine too. Its amazing how sometimes you don’t realise how much you like a brand until you’re rummaging through your things! Urban Decay have some really amazing products, and they have loads of things I want to try too. Everyday staples for me are the Naked Skin Concealer and the Primer Potion. Their concealer is the best I’ve ever used and I genuinely can’t get enough of it, I think I’m on my third tube now! Its super high coverage without being cakey or heavy which is perfect for combatting my dark circles. If I wear eyeshadow (which is pretty much everyday) I need to prime my eyes as they have a tendency to get pretty greasy! The primer potion keeps my eyeshadow in place all day and prevents any creasing as well as making my shadow look nice and vibrant. I’ve been using the Naked Skin Foundation a lot recently but its always been a favourite. Its medium coverage but doesn’t feel heavy at all and it has a really light, blend-able consistency. I’ve also been using the Brow Beater to feather in the front part of my brows as, as its a really skinny pencil it allows me to mimic the look of hairs keeping my brows looking nice and natural. I love their Revolution Lipsticks too, especially the shade Turn On which is a deep mauve-plum kind of colour thats perfect for this time of year. These lipsticks are really creamy and non-drying with a satin-matte finish – beautiful. Lastly is probably everyones favourite, the famous Naked palettes. I’m not even ashamed to say that I own all of the Naked palettes, they really are that good. The quality of Urban Decay eyeshadows is amazing and I’m yet to find a brand that rivals them palette wise. 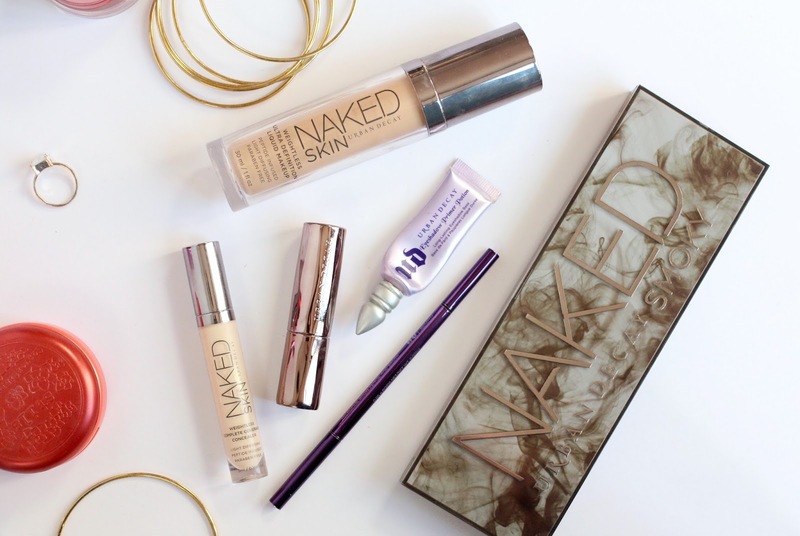 Have you tried any Urban Decay products? What are your favourites?